These entries, from 1860–61, focus less on Regina Shober Gray’s reading than on the successive deaths from diphtheria of members of the Gardner and Adams families during the winter of 1861; they also include a walk-on part for future Associate Justice Oliver Wendell Holmes Jr. (1841–1935), who must have narrowly escaped being infected. 61 Bowdoin Street, Boston, Sunday, 23 December 1860: The dinner party at Mr. Adams’ was a very pleasant one. Mr. & Mrs. Ed. Blake, Miss Jones, and ourselves. It was disagreeably startled by a grand crash of crockery! the falling of a moveable shelf, which was no doubt too heavily piled. It must have made sad havoc in that beautiful dinner set of French china. Of course nobody stopped talking or took any notice, though there [was] noise enough for the crack of doom. I don’t know if I could have taken it so quietly as Emily [Adams] and her father did – I am very sure my husband could not. Saturday, 19 January 1861: …Dined at Emily A’s to meet Dr. & Mrs. Walker, summoned at the last moment in consequence of the failure of one of the lady guests – enjoyed it much. Dr. Inches take[s] the southern side, in our present political crisis, and the conversation was intensely interesting – no one sympathised with him but he stood his own ground with manful self-possession – and he gave me a better idea of what line of engagement is held by the “South-side” than I had before – but it seems to me utterly untenable, though he supported it plainly and earnestly. Sunday, 17 February 1861: Such a painful shock to-day in the news of poor Horace Adams’ death. We had not even heard of his sickness till last night at 10½ p.m. when Dr. Bartlett mentioned it quite incidentally, as a serious case for which Minot had called in Drs. Bowditch & Bigelow – and we were still at breakfast this mg. when Mrs. Richards & an hour later Mr. A[dams] himself sent us the sad sad news. His disease though differing in some particulars was essentially the same as young Frank Gardiner – only much more prolonged and severe in its suffering. Horace’s whole nervous system was so shocked by Gardiner’s sudden death, and by the painful responsibility which fell on him, as medical adviser, that for 2 days he accounted thus for feeling so unwell. But on Wed’y after attending G.’s funeral he came home looking so ghastly and miserable that Emily sent for his friend Dr. Minot who immediately called in Bowditch and the next day Bigelow. On Friday night he raised a piece of hollow membrane 5 inches in length, such as is thrown off from the windpipe in membranous croup – and twice afterwards he threw off smaller pieces. Saturday night Dr. Stearns watched with him, having instruments at hand to open the air passage if necessary. But the night passed off without any alarm – and in encouraging comfort. Horace drank several times, champagne through the night – and seemed refreshed by it. At 7 ½ a.m. on Sunday, Stearns left him feeling quite encouraged – at 10 min. to 8 H. took some beef tea – 5 minutes later he gave one convulsive bound from the bed to the floor then sank half seated on the bedside, convulsed and quivering from head to foot with the last agony of suffocation – his father raised him, to throw out his chest, and succeeded in getting his fingers between the set teeth to stretch open the air passages, while the nurse rubbed him and Emily forced her own breath into his mouth, just the measures poor Horace had told them he took with Gardiner – but equally in vain. In less than two minutes the agony was over – the quivering frame sank back in the stillness of death – the perfect rest that should never more be broken by mortal anguish. Drs. Minot & Stearns were on the spot immediately and instantly made a long incision into the windpipe – but life had fled beyond recall. Rarely have the whole community been so shocked by private affliction as in the cases of these two young men – one in the bloom of youth, the other in the pride and vigour of early manhood, both well known and widely popular in society, and neither of whom dreamed last Sunday morning but that long fair years of useful life were still before them. Both families attend our church and the services were very solemn to-day to all. And there is a feeling of dread lest these be but the first victims of what may prove a long list, to this terrible disease, which seems so little understood as yet, diphtheria. It has been very prevalent all the winter at Cape Cod, and in the town of Cotuit whole families have been swept off. So these young men went from the purer atmosphere here, into a diseased one there – will it stop with them? God grant it may! Dr. Gray went round this p.m. to be present at the post-mortem examination – but it was deferred till tomorrow for some reason. I went there after dinner, and sat an hour with Mr. Adams, who seemed to find some relief in his restless sorrowful excitement, in talking it all over with any one of whose sympathy he felt sure. Emily I did not see. Only Miss Jones had been with her. Poor girl this leaves her lonely indeed. Mr. Adams tells me Horace slept in the room with Gardiner several nights to take care of him, insisting upon taking young Holmes’ bed there, and giving up his room to Holmes – so like Horace to do so – always genial, friendly and kind-hearted. Thursday, 21 February 1861: A quiet evg. Morris [Gray] asleep – all the other children gone to theatre with papa & Uncle Fred [Gray] and I just poorly enough [to] be lazily interested in “Over the Cliffs” – an unnatural kind [of] book it is, too! Yesterday at noon we all assembled to look “our last of earth” on poor Horace Adams. It was a wet, miserable day – the rooms were crowded, especially by young men – and a very solemn awe pervaded the assembly. A touching sight it was to see Frank Gardiner’s whole family there – just one week ago, to the very hour Horace had stood at his grave – and now! He was not much wasted, and looked very natural – and oh so like Charles, only less fair. Poor Mr. A. looks dreadfully – Emily I have not seen, but hear she is like one stunned into calmness. The coffin was profusely covered with flowers – exquisite ones in wreaths, crosses and loosely scattered round. Dr. Walker read the service. Scarce 4 weeks before, he dined there when I was one of the party – how little any of us thought then our next meeting at that house would be to lay in the grave, the youngest & seemingly most vigorous of all that gay dinner party. Charles Frederick Adams (1793–1862) was married to Caroline Heselrigge Walter 1822–37 and to Anna Dehon in 1844. Mr. Adams’s namesake son was at the time of his death engaged to Mrs. Gray’s sister Sue Shober. In 1860, the family lived at 26 Chestnut Street. Edward Blake (1805–1873) married Mary Morton Jones Dehon in 1838. The Edward Blakes lived at 21 West Cedar Street in 1860–61. The diarist’s close friend (despite the formal address) Anna Powell Jones (1807?–1864). 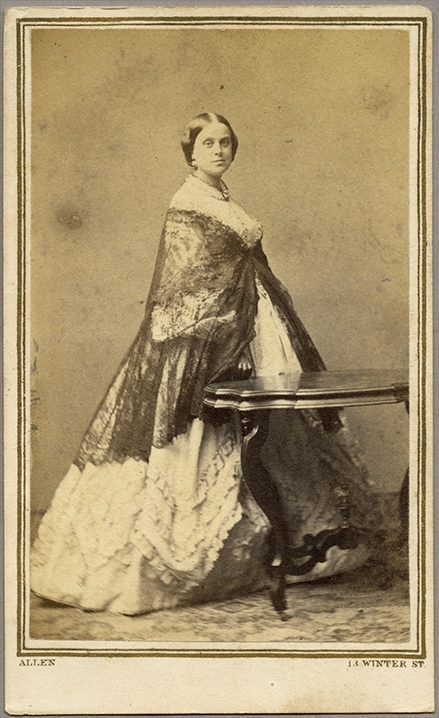 Mrs. Gray’s intimate friend Emeline Matilda Adams (1823–1883), who married Caleb Agry Curtis in 1864. The Rev. Dr. James Walker (1794–1874), President of Harvard College 1853–60. He married Catherine Bartlett in 1829. Dr. Herman Brimmer Inches (1813–1889) of 40 Beacon Street. The Civil War was imminent. Helen Maria Read (1819–1898) married George Gardner in 1838. Mr. Gardner’s sisters were married to Dr. Gray’s uncles John Chipman Gray and Horace Gray, so Mrs. Gray’s inability to spell the name seems inexplicable. George Gardner’s nephew George Gardner Lowell (1830–1885). Emily Adams’s brother Dr. Horace Walter Adams (1827–1861). Dr. George Bartlett (1807–1864) of 3 Tremont Place. Dr. Henry Ingersoll Bowditch (1808–1892) of 112 Boylston Street. Dr. Jacob Bigelow (1787–1879), the projector of Mount Auburn Cemetery. Horace Adams’s aunt, Cornelia Wells Walter (1813–1898), who married William Bordman Richards in 1847. Perhaps (Dr.) John Stearns of 71 Beacon Street. King’s Chapel on Beacon Hill. All of her siblings had now died. Francis Lowell Gardner and Oliver Wendell Holmes Jr. were members of the Porcellian Club at Harvard. Over The Cliffs (1860) by Charlotte (Kingsley) Chanter (1828–1882). Charles Frederick Adams Jr. (1824–1856), Sue Shober’s fiancé. Enjoyed these letters. The deaths from diphtheria must have been heart-wrenching. This is the first time I’ve seen Mrs.Gray make any reference to the growing pre-war crisis. This seems surprising considering her general level of culture. It seems that nothing except disease or bad marriages could threaten their perfect little world. I suppose references will become more frequent as she advances into 1861. Farrar, the pre-war references to the South are few, although in the final weeks of the presidential election she writes a bit about the candidates (and the parades that divert her children). I think what we see in the Gray diary, especially in the 1860 volume, is that the looming civil war which concerns us is not yet an especial worry for contemporaries. Mrs. Gray writes at length about the war, once it starts — but perhaps like a 1914 diary, the milestones that we see leading to war are not experienced as such in 1860-61 or in January-June 1914. I included journal excerpts (1860) and letters (1865) of Eliza Caroline Clay in my book, Shades of Gray: The Clay & McAllister Families of Bryan County, Georgia (1999 – still available on Amazon). These writings may give you some insight as to how the family viewed the War. Thanks, Carolyn! Mrs. Gray also quotes some of the views of the Clay family as they visited Boston before, during, and after the Civil War. These diary entries are so vivid. Brief but they bring the scene to life. We take so much for granted today in terms of health. No one today could imagine the number of losses of the young suffered by earlier generations. Thank you for posting these. Thanks, Virginia. Yes, modern as she is in so many ways, the world Mrs. Gray describes (she was born 1818) is very different from ours.